The National Pharmacy Association (NPA) is the representative body for the community pharmacy trade in the UK. In addition to supplying a range of ancillary pharmacy support products at competitive prices, it seeks to support its members by influencing government policy and consumer opinion. It is also a leading provider of indemnity insurance and legal advice for community pharmacies. The NPA is transforming its Pharmacy Sales business and ‘Web Shop’. The NPA procures and distributes over 500 pharmacy support products to the Association’s 3,900 members and 12,500 pharmacies across the UK. The new service will increase this range to over 1,300 products. 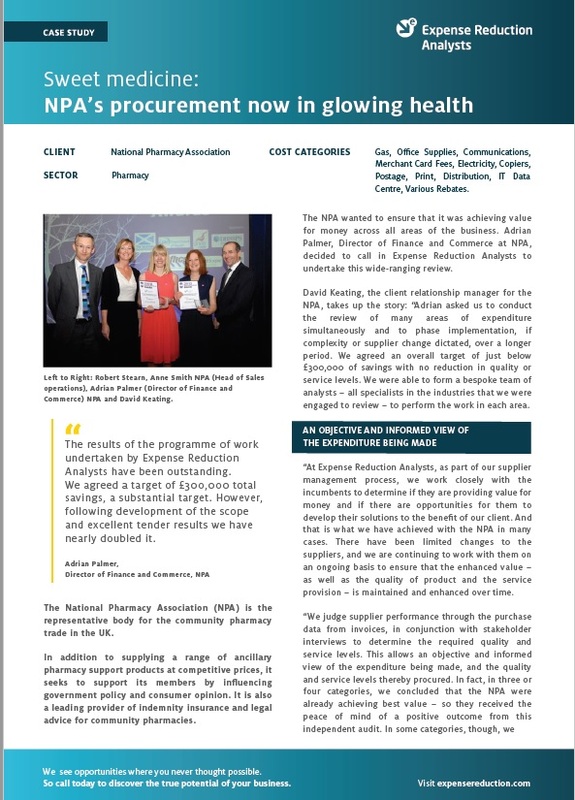 To find out more about how ERA helped National Pharmacy Association, including results, savings and more details from the client, download the full case study now.